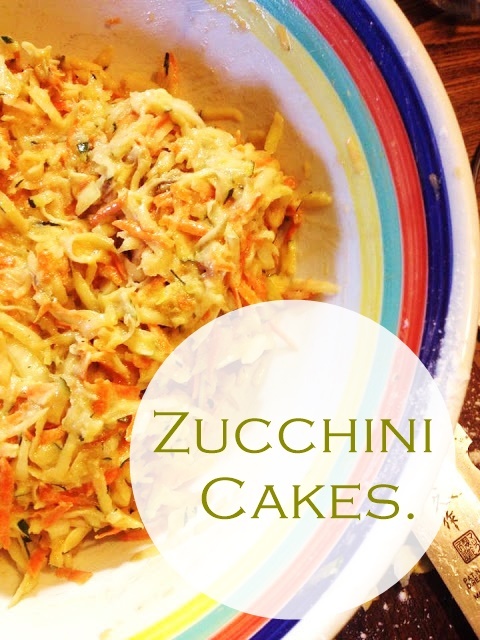 If there's one thing everyone has way too much of in the garden every year, it's zucchini. In our garden right now, aside from the (literally) thousands of tomatoes, we have a huge zucchini plant-and it already has about nine baby zucchini on it. And while zucchini bread is all well and good, it's the fried cakes that I love best. Here's my favorite way to make them. Two medium zucchini. 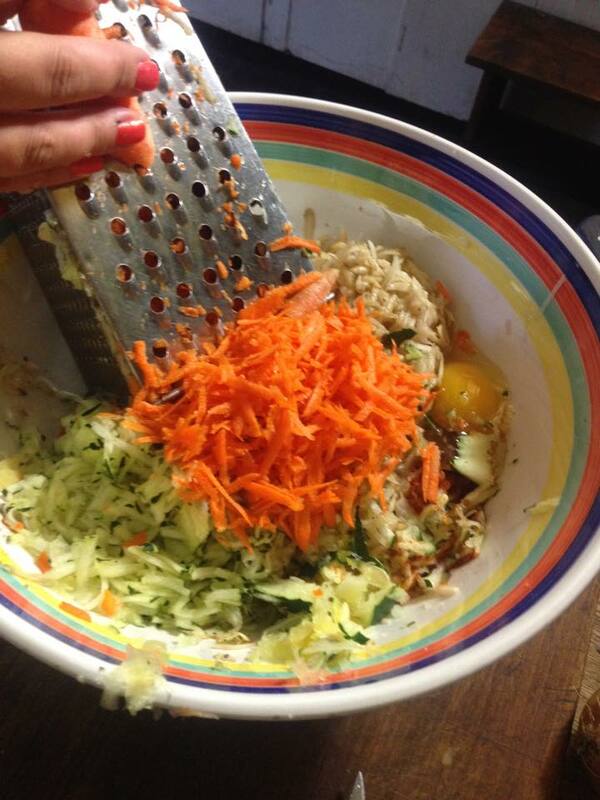 I like to do half zucchini/half grated carrot. Sometimes I also grate in a little potato--it seems to add extra flavor. Two tablespoons grated red onion--I like a bit more, for add flair. Two large eggs, lightly beaten. Six to eight tablespoons all-purpose flour. Half a teaspoon freshly ground black pepper. Unsalted butter and vegetable oil. Grate the zucchini into a bowl using the large grating side of a box grater. Immediately stir in the onion and eggs. Stir in the flour, the baking powder, salt, and pepper. If the batter gets too thin from the liquid in the zucchini, add a bit more flour. Heat a large pan, over medium heat and melt 1/2 tablespoon butter and 1/2 tablespoon oil together in the pan. When the butter is hot but not smoking, lower the heat to medium-low and drop heaping soup spoons of batter into the pan. Cook the pancakes about 2 minutes on each side, until browned. I like mine pretty crispy. Place the pancakes on a sheet pan and keep warm in the oven (at 300 degrees). Continue to fry the pancakes until all the batter is used. The pancakes can stay warm in the oven for up to 30 minutes. Serve hot. Garnish with scallions and sour cream. Makes about ten, three inch cakes (I double or triple the recipe). Hey thanks for the recipe! That sounds so good! I think I'll love this way of eating zucchini! I'm a big fan of it and have several growing on our plant right now! They came out pretty good!! I felt like they were a bit too eggy for my liking though (maybe just one egg next time?) 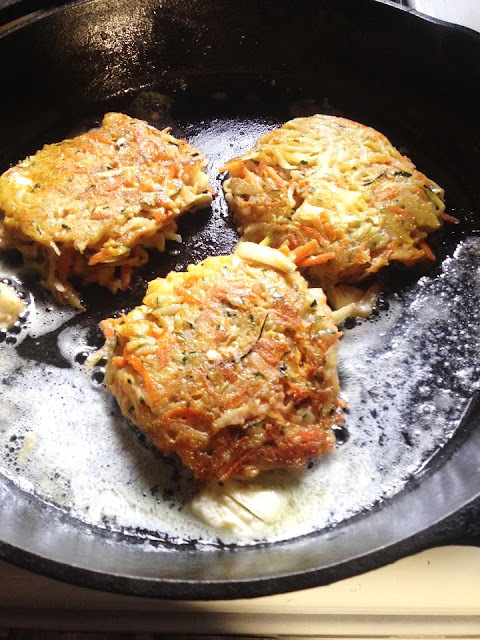 I did it w/ zucchini, carrot and red onion! :) Thanks for sharing! !